Airships are titanic air balloons resembling whales that are filled up with a gas lighter than air and that are free to float in the sky. Seeing an airship crossing the sky will make you feel like time has stopped for a brief moment. Unlike airplanes, swiftly flying through the clouds, airships just look like they're floating in the sky. Would you like jumping on one? It seems that passenger airships were a thing at the beginning of the 20th century, but unfortunately they're not being used for air travel anymore. 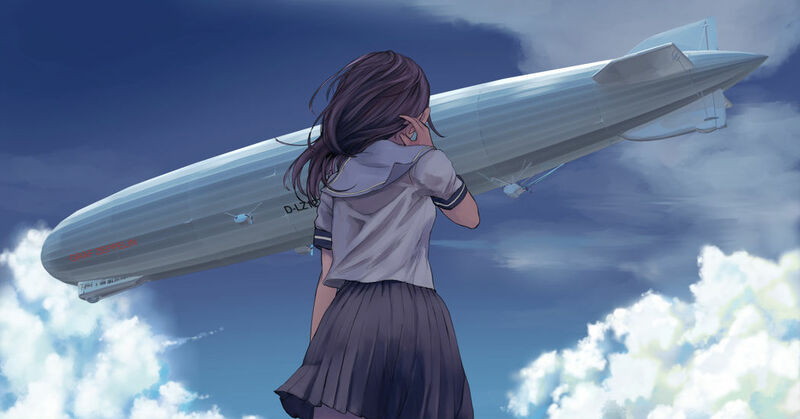 Today we feature illustrations of airships leaping gently in mid-air. Enjoy!